...and this can take some time - especially as you fiddle around with it, getting it right. Of course, you are limited to 80 characters (or less - once indenting quotes have been done, you are often left with 78, then 76 [although the signature should be taken out with the email program when it encounters a double-dash at the beginning of a line followed by a space and then a new line like so '-- ']) width so if you want to do something with a lot of letters, you need to be careful if you are going to get it all on. So instead of doing it by hand, you can install and use one of the programs that will do this for you but if it is just one or two designs you need, it is a waste of time installing one. You are far better going for a web-based service. One such service will create an ASCII text design for you, using just the characters that you will find in emails - no fancy symbol characters that won't reproduce properly - effectively using a number of different font designs. The URL is http://www.network-science.de/ascii/. Just type your text, select a font and click on the 'do it!' button. If you want to see what your text looks like using all of the fonts, choose '_all fonts with your text_'. You can just highlight and copy the text, pasting it into your email footer or wherever you want. Once you have your text just the way you want it, there is nothing stopping you from adding your own images. All of the characters are easily accessible through the keyboard - note the use of letter 'O' for the reflection in the eyes. In this case, the characters used represent the outline of the image but you can use other characters if you want to represent half-tones. Some image processors have macros that you can use to record actions and then play them back later - this facility has been available for at least a decade with one example being Micrographx Picture Publisher. However, many macros are not particularly flexible and you might well have to create new ones for different situations such as font size and so on. The GIMP, provides a set of macros that will produce logos in different styles that you can size to make large headers or small links. Each one allows you a number of options such as font and various colours, along with any other relevant parameters. You can get to the logos menu by selecting 'Xtns', 'Script-Fu', 'Logos' and then you can start experimenting. Click on the image on the right to see the output and a few tips. In the main GIMP menu (on the form that has the toolbox), click on 'Xtns', Script-Fu', 'Logos', 'Glossy' (or whatever you want to try out). This is one of the more extensive dialogue boxes - many of them are a lot simpler than this. At the top, you can type in (or paste in) any text you want (assuming that the characters you are using are in the font you are going to use). Next, you have the font size (in pixels) and below that, the font itself. Click on this button and a pop-up window appears, allowing you to select a different font. These three controls are pretty standard amongst these dialogue boxes. Next, you have the blend gradients for the text and outline along with a few other options. If you click on the gradient button (top-right), the gradient selection dialogue box appears. You can do with this what you would normally - select one or edit/create one - clicking on the close button when you have finished. Below this, you will find the option to reverse the gradient and then the blend gradient for the outline, along with the option to reverse that and then how big the outline should be. 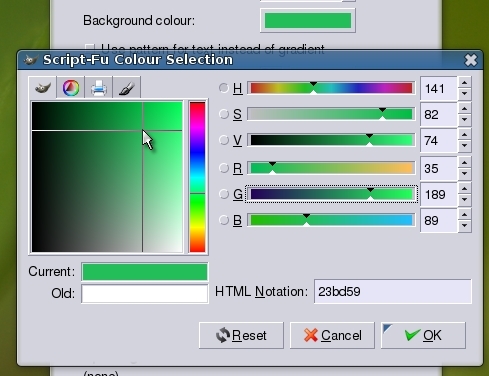 Next, you can select a background colour - again, by clicking on the button. This time, the colour selection dialogue box opens up with all of its usual functions and options. Clicking on 'OK' closes it. Following that, there are three patterns to choose. Again, click on the browse button to display the pattern selection dialogue box. Once you have what you want, click on 'Close'. Below that there are various options regarding what you can put where and finally at the bottom, you have the options of including a drop shadow, along with the x and y offsets. Finally, click on 'OK' and your logo will be produced. Note that in the layers dialogue box, you can see that your image is still in layers. You can select a layer and drag a colour into it or even a pattern. You might find that some layers will overwrite completely if you do this (click on the image window and press [Ctrl][Z] to undo it) and others will work out okay. Also, you can remove the background layer (in the layers dialogue, right-click on the layer and then select 'Delete Layer') to make the logo transparent and then make it into one layer (right-click as before and then select 'Merge Visible Layers' then select 'Expand as necessary' and click 'OK'). You can then save this as a PNG file or some other format that supports half-tone transparency. This is the sort of thing you can get by messing around, dragging patterns into the image. Once you have something that you like that you can test at different sizes, make a note of the parameters you used (from the dialogue box) and then make your logo/style sets for your web site. Some people have been saying that the GIMP hangs during first boot when it starts looking for fonts the first time that it is run in Windows Vista. Certainly, it does appear to grind to a halt but this only happens for the first time and is only a minute or so (depending upon the speed of your machine, number of fonts and so on). In Vista, the fonts are in a different location to other versions of Windows so The GIMP searches for them (and finds them). All you have to do is wait and once it has finished doing this, it doesn't have to do it again because it now knows where they all are. It is possible to run a system without a root GUI - this is something that is done with Ubuntu. Ubuntu doesn't allow users to log on as root and all normal activities are performed as an unprivileged user. As a GUI user wanting to do something as a super user, you have to supply your regular password to do this when prompted. In fact, root is not permitted to open a GUI session. This way, ordinary users have an easier time of coping with security but without the risk of being permitted to log on as root and then go browsing on the Internet and opening up the machine to whatever anybody wants to throw at them. By having only one password to remember - the one that they use all of the time any way - they will not be locked out by forgetting it. If a user does need to use the command line, they can type 'sudo [command]' or, if they need an interactive shell, they can type 'sudo -i'. The disadvantage is, of course, that there is only one password. Sometimes, you need to use ftp or its secure equivalent but the machine you want to log into has no such server although you can log onto it. This problem, though, is not as difficult as it might at first seem. All you need to do is install an ftp server on your own machine. You should have at least one included in your distribution and they are fairly easy to configure - vsftpd is a good one and the vsftpd.conf file is fairly well explained. Being your own machine, you have the final say on what goes on it and what doesn't so you can install your own ftp server and adjust your firewall accordingly. Next, log into the remote machine using ssh (or telnet if that is what you use) and then ftp back to your machine. In the diagram above, the command for the telnet/ssh is in blue as you can see with the command line for paul@obsidian, 'ssh'ing into 'zircon. Next, when in zircon, ftp back out to your computer - this is in green as is the command line for zircon so you can see that from paul@zircon, I'm 'ftp'ing back to obsidian. Finally, remember that when you 'put' a file, you are transferring it to your machine from the remote and vice versa with 'get'. 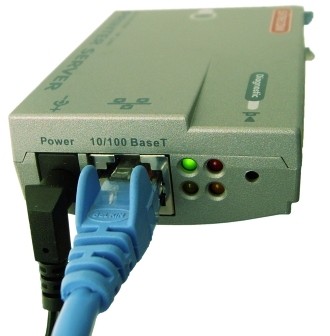 Using a printer server like the one on the right, you can convert a Centronics-interface printer into a network printer. You can also get these with a 25 pin D series connector socket as well so if your printer has one of these instead of a Centronics interface, you can use one of those instead (or just use one any way as normal printer leads are 25 pin D series connector to Centronics). With such a printer server, there are a few things to configure but once they are up and running, there is little that can go wrong. However, if your printer prints text all right but won't print graphics properly - adding extra characters at the beginning of lines that it then messes up - you might have to tweak the configuration a little. Especially if your printer worked all right when plugged directly into the computer. One feature these servers have is to convert a new line character ('LF') to a carriage-return/new-line pair ('CRLF') which effectively makes the carriage return to the left and the paper to feed by one line. Think teleprinter or typewriter here. This is fine for printing text but with graphics, it is a completely different issue. Graphics usually consist of a special code telling the printer details such as: the length of the following graphics string; the physical horizontal and vertical space required for each pixel; the colour depth; and, so on, followed by the graphics codes which have the range 0..255 (or 0x00 to 0xFF). This range includes the code for a linefeed. As a result of this, each time the server sees the code for an LF (10 or 0x0A), it inserts a 'CR' (13 or 0x0D thus making a 0x0A into a 0x0D0A or 0x0A0D which is two bytes instead of one), shifting all of the other codes along by one. As a result, the last character(s) meant for graphics end(s) up being printed as a character for each 'CR' inserted as it appears no longer within the graphics string. The solution is to log onto the printer server's web page. On one of the pages - usually 'Logical Printers' or similar (see the screenshots on the right and above-right for two different examples that contain essentially the same information) - you should find an option to 'Convert LF to CR/LF'. Make sure that this is unchecked and save it - you might have to switch the server off and on again for this to take effect. Your printer should now work as well as when it was plugged directly into the computer. Opening files with a mouse click is easy and adding a file association is almost as easy but make a mistake and you need to know about undoing file associations. If you right-clicked on an image file on a network share and selected 'Open With', 'Other' and then selected The GIMP (or any other program for that matter) and checked the 'remember' box, you might have problems later on because following that, each time you click on any directory to open it up, it will try to open up The GIMP and it, in turn, will give you an error message. The problem is that with a network share (certainly for SMB), you managed to associate an inode with the GIMP. However, you can solve this by opening up 'Control Centre (Configure the Desktop)' and then selecting 'KDE Components' and 'File Associations'. In the File Associations pane on the right, expand the 'inode' section of the tree by clicking on the '+'. Click on 'Directory' and a further section will open on the right of that. On the 'Application Preference Order' list, click on the GIMP and then on the 'Remove' button on the right. This will remove the GIMP from the list. Next, click on 'system_directory' and if it is there, remove it from that list in the same way. Once you have done this, you can also work your way through the image types as well while you are at it. If you mostly want to view jpeg and png images with, say, Gwenview, instead of edit them, you can click on those types, click on the programs in the list on the right and prioritise them with the move buttons. When you have finished, click on 'Apply' and you can use your account again. Windows names each partition, regardless of drive, from 'C:' upwards. Grub has to make sense of all of these - a thankless task. One problem you can have is if you put several OSes onto one system. Naturally, you want to be able to boot into each one from a boot menu and this is where GRUB comes into it. First of all, let's look at two physical system configurations. The normal system is what you would get if you went and bought one from a shop - it has one HDD and, of course, it makes sense to have both the optical drive and the HDD as masters on different channels. That way, if you are burning a CD or DVD - exercises where redundancy in channel bandwidth capability are essential - the data flows better through the system. The custom built system is what you might end up with if you built one yourself using three HDDs. The first HDD (master on channel 0) has the OS(es) on it and is used by the system to run the system - there is little traffic there once the system is up and running, apart from log files and other stuff that is more intermittent and not likely to interfere with CD or DVD burning. Another consideration is that the main data storage should be on a different channel to the optical drive. The optical drive only occupies one slot so it makes sense to have that on the remaining slot on channel 0 and have a data drive or two on channel 1 so that either you have one HDD there and can expand it or, have two to start with - either way, you are not going to have to move your optical drive. So, there goes the myth that the optical drive is always hdc in Linux. If you only installed one OS, you would never need to know any of this but if you install several, you need to understand how Grub allocates the names to each drive and partition because here, we have hdc (the third drive) as hd1. On the right, you can see how the partitions are allocated (I've put the numbers in brackets to make them clearer). The master boot record for the first drive is hd0 and that is what you would use if you wanted to install grub there. The first partition of the first drive is hd0,0 and if you want to install grub into the boot record for that partition, that is what you use. When you install other operating systems, you get a chance to install grub where you want with them and for the sake of preserving your system, I would recommend choosing a partition boot record that has not already got Grub in it - this way, the configuration files will be preserved. One way of being able to boot into all of your OSes is to edit the first copy of Grub's menu file so that it includes them. All you do is add a line to the /boot/grub/menu.lst file for each one a bit like the following. This will will make it chainload into Solaris' copy of grub so you end up with another boot loader menu. And, there is nothing wrong with that. When you install Linux (or Solaris, FreeBSD and so on), you get the opportunity to install Grub (the GRand Unified Bootloader) wherever you want. This includes the disc's master boot record in addition to each partition's. For the first hard drive (normally the master on channel 0), the master boot record is hd0 and for the second, it is hd1. For a machine that has been bought with one hard drive, normally, your optical drive would be the master on channel 1. However, if you want to have a smallish drive for your OS and enormous DVD-editing storage, you might have three HDDs so that any CD/DVD writing you do will be from a drive on channel 1 (as in the configuration in the diagram) to the optical drive in the slave on channel 0 as noted above. Of course, with Grub, the optical drive is ignored so in this instance, hd1 is the master on channel 1 which, under Linux, is hdc. The problem is that: unless you have run into problems with this, there is no reason why you should know any of it. As a result, when you have installed your new, second OS, you can install grub on the partition boot sector where you think it needs to go - which will most likely be wrong. This can lead to the situation on the right where you chainload into versions of Grub that are on a different drive to the one where the OSes they refer to are installed. Again, this is not a problem unless that hard drive fails or you do something that overwrites one of its partition boot sectors. Putting all of your OS Grub menu list files into one will solve this but be aware of which OS is installed on which partition so that you can refer to it correctly. Linux will load using Grub, which copes with it well. You can pass options to it and it understands the file system. However, there are some where you do have to chainload. Examples below are OpenSolaris, OpenBSD and Windows. This is what a menu.lst file might look like if you had all of these on your system (note that the partitions refer to this hypothetical situation - see above for actual drive/partition designations). With a 64-bit, multimedia machine running a stable, specially compiled kernel, what more could you need? You don't need a lot of power to edit MIDI and if you have a dedicated sound card that can do all of the processing for you, even a Pentium 200MHz machine running Cakewalk Professional 2.0 on Windows 98SE will do an excellent job. However, if you want to do sound processing, post-production and CD image burning (as well as CD cover design and so on), you'll need the power of a modern machine. For a production environment, 64Studio is excellent. This Linux distribution has a custom-configured, multimedia kernel, compiled for AMD 64-bit and Intel EM64T processors ( http://www.64studio.com/ ) and will handle dual core processors as well. In addition, it has the stability and security of Linux and, it's free. 64Studio uses the Gnome interface so it is all fairly straight forward and easy to follow. Under 'Sound & Video', you have all of the audio tools that you should need to write, play and record virtually anything - whether you are transcribing Rossini to MIDI for a university project or producing an album for distribution on CD. Drum editing can be done with Hydrogen without using any other programs on 64Studio. You can save the files from this in MIDI format to import into other songs if you wish. If you want to set up the system to do general MIDI editing with sound, you need to load the JACK Audio Connection Kit (Jack Control). Click on 'Connect' and you can see the Audio and MIDI patches. 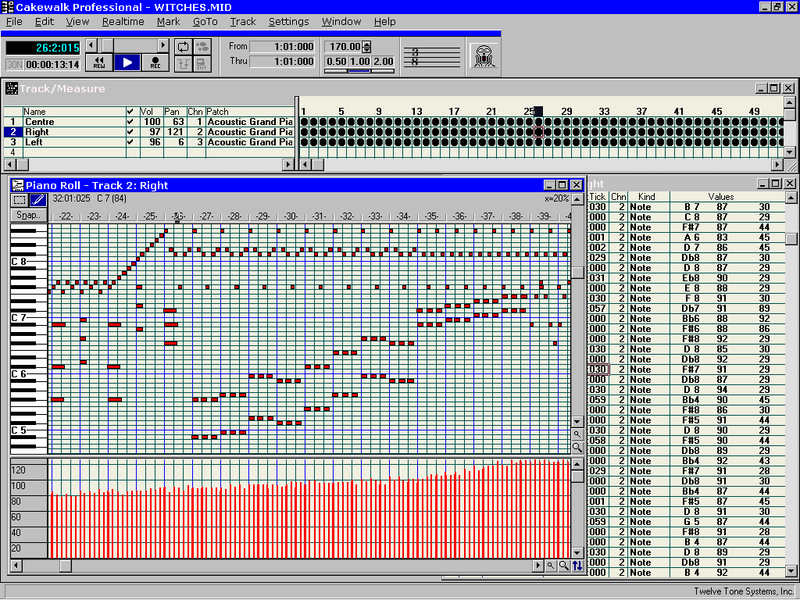 Next, if you aren't using a sound card, load QSynth and for MIDI editing, use Rosegarden. If you want to have all of the fun of a Moog Synthesiser, run the Alsa Modular Synthesiser (AMS) which takes MIDI and audio as input and generates audio output. You can see the audio and MIDI connections in the Jack Connections kit. Behind the AMS is voltage control. You can use a low frequency oscillator to generate a voltage that changes slowly. This, you can then use as the control voltage for a voltage controlled oscillator, voltage controlled filter and so on. You can change the waveforms of these and even how they change by restricting slew rate (like a portamento), adding other voltages or signals to them, using a sample and hold which will take a sample of the voltage and add it to the voltage that it already has (integrating it) and then hold it for a time (which you can also change) and so on. Using a ring modulator, you can do anything from producing a Dalek voice to making sounds like bells. The AMS can either be used to produce a live sound from midi output (say, from Rosegarden) or to produce a recorded sound for inclusion on a track. Once you have a patch system set up the way you like it, you can save the configuration by opening the patchbay form and clicking on 'New'. In the new patchbay definition dialogue, where you are asked if you want to create a patchbay definition as a snapshot of all actual client connections, click on 'Yes' and then 'Save'. 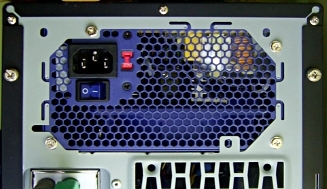 Unless you have a sound card, you are not likely to have MIDI sockets on the back of your computer (and even then, they are likely to be in the form of a 15-pin D-Series connector socket). There are, however, a number of devices that will allow you to use MIDI in and MIDI out and plug them into your computer via USB. If you go to your local music shop, you will probably be offered a substantial device that is easily capable of taking all of the knocks that on-the-road life has to offer. Some of these also have built-in ADCs which are completely unnecessary with a PC as they already have them. On the other hand, if you are just considering home-use or, you have a studio where things that have been connected don't get moved, a cheaper device such as the one in the photograph will do nicely - it runs on and integrates into 64-bit Linux without any driver issues. The problem with built-in leads is that if the leads are moved around and eventually fail, you have to replace the whole unit. However, if you never move it, that is not an issue so a model like the one on the right is suited ideally for home use or static studio use. There are many ways of taking the signal input from MIDI and outputting a sound - AMS and others generate their own sound but if you want something that sounds like an 1880 Barbe double bass with the original varnish and silver-wound gut strings, bowed with a black hair bow or an alto ophicleide, you really need a SoundFont (or learn how to play one yourself). 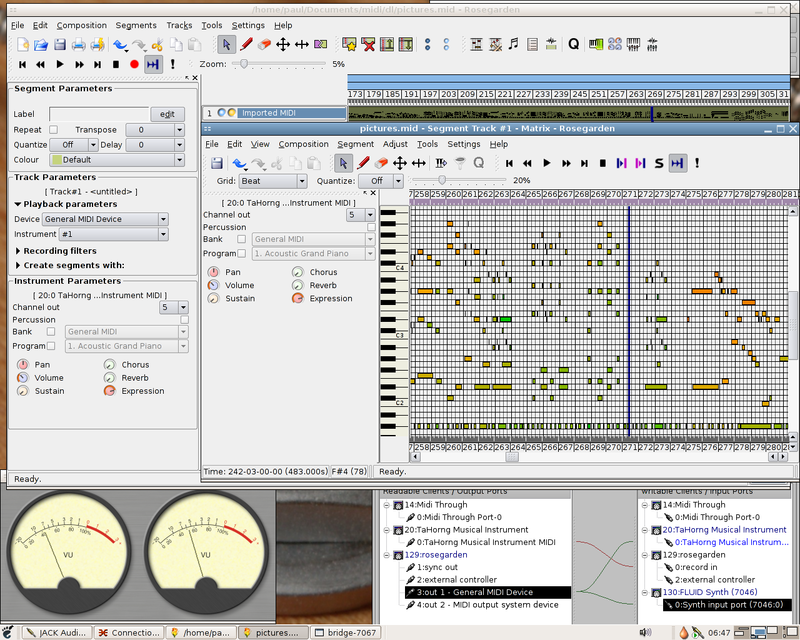 The SoundFont format used by QSynth is '.SF2'. These files can contain just one instrument or a whole General MIDI set of 128 instruments from an acoustic grand piano through to a gunshot (plus the drums of course). Unless you happen to have just what you want, the best place to look is, of course the Internet. There are many sites that have free sound fonts. Some are free to use under any circumstances, some have restrictions that they can only be used for non-commercial, personal use and others, you will have to buy. Whilst many single-voice SoundFonts are quite small - a few hundred KiB to several MiB - a full sound font is in the order of 100MB or so. This is something worth considering if you are not on at least a T1 connection. We hear of all sorts of precautions about static when assembling hardware but are any of them worth doing? It is a fact that static electricity will destroy electronic circuitry such as memory and mother boards. However, these are a lot less sensitive to it than they were - things have advanced and whilst CMOS and similar technologies will still die, they are better protected now. Although it is safer, it is still risky. However, if you take these basic steps, you can build your own rig or add a memory stick without any significant risk to the hardware. You need to make sure that the opportunity for static build-up is not there and, if it should be, the components are not put at risk. The mother board's screw holes have areas of tinned copper plate to make contact with the chassis. Once one of these is screwed in (either to a brass spacer or an indented hole) it is safe. Plug in the power leads and carry on with the rest. Your mobile phone doesn't need to be switched off; and, your torch doesn't need to be BASEEFA-certified. Note that at no point did you need a wrist band although if you are in a wheel chair, that would be a good thing to use in case you have to move around a lot.